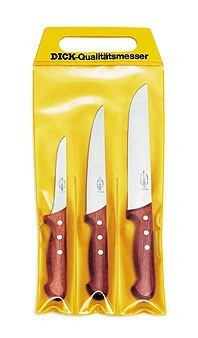 Suitable for meat preparation in butcher shops or restaurants, this set comes with a boning, sticking and butcher knife. Made of quality construction, each knife is crafted with a wooden handle and stainless steel blades for added strength and durability. Extra-sharp and strong, this set provides superior control and produces professional results. It can be used to skin, debone or bleed out hogs and other animals for all of your culinary needs.